Little Clarity For Parents Wondering Where Their Infant Should Sleep : Shots - Health News The American Academy of Pediatrics recommends that infants sleep in their parents' room for at least six months. But some experts say scientific evidence does not back up the guidelines. Babies get less sleep at night and sleep for shorter stretches when they sleep in their parents' room after 4 months old, a new study finds. Babies get less sleep at night and sleep for shorter stretches when they sleep in their parents' room after 4 months old, a new study finds. Parents are also more likely to engage in unsafe sleep practices, such as bringing their child into their bed or leaving pillows, blankets or stuffed animals with the baby when the infant shares their room. The findings appear to contradict recommendations from the American Academy of Pediatrics for safe infant sleep, creating more confusion for parents trying to choose the safest, yet most practical and realistic, place for their babies to sleep. 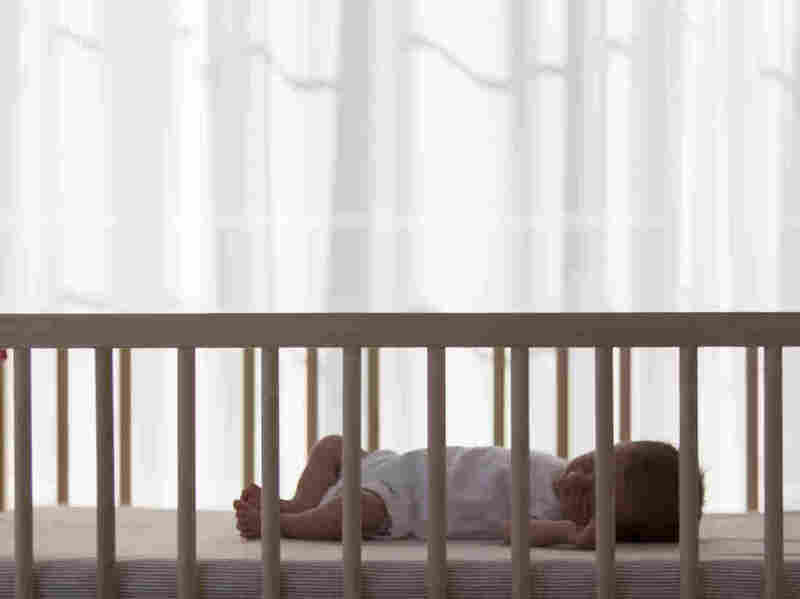 The AAP recommends infants share a parents' room, but not a bed, "ideally for a year, but at least for six months" to reduce the risk of sudden infant death syndrome (SIDS). Approximately 3,700 infants died of sleep-related causes in 2015, including 1,600 from SIDS, according to the Centers for Disease Control and Prevention. Although this recommendation has technically been part of AAP policy for years, it was largely overlooked due to the policy's wording until last October, when new recommendations were released. At the time, some prominent pediatricians questioned the evidence behind it. Among the skeptics was Ian Paul, lead author of the new study published Monday in Pediatrics. "It's important for the Academy to have strong evidence and not just expert opinion to support our recommendations because these guidelines have such influence on practice and on parenting and child health," Paul says. "One of the reasons we wanted to explore this is that the evidence is really weak for 6 to 12 months. I think in [the Academy's] strong desire to prevent every single case of SIDS, they have looked at the data with a biased perspective." Paul analyzed data from 230 families participating in a randomized, controlled trial for up to 2 years. Half the mothers were encouraged to consider moving their children at 3 months old to wherever the child would sleep at 1 year old. The other half received intensive advice on reducing SIDS risk, in which nurses visited the home and provided specific feedback on improving the safety of the sleep environment. And infants who slept in their own rooms after 4 months slept for longer, in general. Nine-month-old room-sharing infants slept an average 9.75 hours per night, compared to 10.5 hours for those who began sleeping alone by 4 months and 10 hours for those who began sleeping alone between 4 and 9 months. Infants who slept alone after 4 months also slept for longer stretches: 9 hours compared to 8.3 hours for those infants who slept in their parents' room between 4 and 9 months and 7.4 hours for those who continued to share their parents' room after 9 months old. By 2.5 years old, all the children got a similar amount of total daily sleep, although those sharing their parents' room through 9 months old got 45 minutes less at night. Given these findings, Paul worries about unintended consequences of encouraging parents to keep children in their parents' room until 1 year old. "There are so many other factors in child and parent health that are consequences of this decision," Paul says. He said it's completely impractical for parents to start sending children to their own room at 1 year old, when separation anxiety peaks. "That's the worst time to make a change from a developmental perspective." Experts in developmental infant sleep generally agree with him, according to Jodi Mindell, associate director of the Sleep Center at Children's Hospital of Philadelphia. Mindell founded the Pediatric Sleep Council's website babysleep.com, a free resource of evidence-based information on children's sleep. "We want babies and parents to get a good night's sleep because we know that will affect infant safety, infant development and family wellbeing," Mindell says. "It's a balance of trying to make sure babies are safe, everyone's getting enough sleep and everyone's developing appropriately." Past research has shown that infants sleep better, go to bed earlier and sleep for longer periods at a time when they sleep in their own rooms, Mindell says. In this new study as well, infants sleeping on their own at 4 months old were twice as likely to have a consistent bedtime and be in bed by 8 pm than the other infants. Families should feel free to decide without fear whether their babies sleep in the parents' room or their own room, she says. "I think the AAP guidelines unfortunately scare parents, and we don't want parents scared and avoiding doing what's going to work best for their family," she says. "You don't want parents resenting their child because they don't get a break." More recently, many parents have wrangled with the difficulty of following other AAP guidelines, such as the updated recommendations against bed-sharing, which nonetheless acknowledge that mothers often fall asleep in bed with their infant, and confusion about the safety of swaddling infants for sleep. The updated recommendations on room-sharing were actually intended to offer parents some leeway after 6 months, says Rachel Moon, lead author of the AAP recommendations and head of pediatrics at the University of Virginia School of Medicine. "We're being as careful as we can," Moon says. "Yes, it's important that families get enough sleep. It's also important that they have a baby that wakes up in the morning." But while there is ample evidence of risks from bed-sharing, evidence of risk from not sharing a room after the child is 6 months old — when fewer than 10 percent of SIDS deaths occur — is far weaker, Paul says. "For a family affected by a death after six months, that's a terrible loss, so I understand that perspective," he says. Yet he notes that infant sleep deaths remain exceedingly rare, especially after 6 months old. For the 4 million children born each year, other risks from inadequate sleep in parents may be more serious, such as motor vehicle accidents, poorer bonding with their baby, marital strain and child abuse such as abusive head trauma (shaken baby syndrome), Paul says. Parents, particularly moms, could also be at greater risk for postpartum depression and accidental injuries around the home without a solid night's sleep, Mindell adds. "These are all considerations when you take a family-centered perspective on infant sleep and don't focus only on the relatively rare, yet certainly devastating, occurrence of SIDS," Paul says. In fact, room-sharing after 4 months may even increase SIDS risk in other ways, his study shows. "One of the surprising things we found was the room-sharing parents had less-safe sleep practices," Paul says. Room-sharing infants were four times more likely to end up in their parents' bed during the night than those sleeping independently by 4 months and 9 months old. The odds of risky items being in babies' sleep environments, such as pillows, blankets and stuffed animals, also doubled for room-sharing infants at 4 months old. Still, the AAP, which periodically updates its recommendations as new evidence emerges, is unlikely to change their recommendations at this time, Moon says. She acknowledges that downstream consequences are a valid concern but that too few data exist to know if they're really happening. "I haven't looked at the data to say that if you're room-sharing with your baby, there's a higher risk of a car accident. I don't know that that data is out there," Moon says. "Sometimes there are things that seem like they're related, but when you do the study, they're not." She points to research showing that parents often underestimate the sleep they're actually getting and that findings on parents' sleep duration while room-sharing are "all over the place," sometimes depending on whether the mother is breastfeeding or formula feeding. "Yes, maybe parents are more sleep deprived if they are room-sharing, but we don't know that for sure, and until we do, we cannot make policy based on anecdotal reports or perception or assumption," Moon says. "I know it sounds one-sided, but our expertise is in [infant sleep deaths], so our job is to look at this from the SIDS perspective." But that's the problem, Paul and Mindell say. "They're only looking at infant safety with this one lens in the extreme," Mindell says. "It has to be balanced by the bigger picture." Moon also emphasizes that the AAP is "pretty persnickety at trying to base our recommendations on the literature." But Paul says the three European studies the AAP used to recommend room-sharing up to 1 year don't actually support it. In one, the infants over 4 months old who died of SIDS were actually more likely to be room-sharing than sleeping in their own rooms. Another dates to the 1990s when stomach sleeping — a strong risk factor for SIDS — was much more common. And the average age of children in the third study was 3.5 months; only 15 of the 123 total infants who died of SIDS in that study were sleeping in their own room. All this back-and-forth can leave parents confused and frustrated. Ben Hoffman, a pediatrician who specializes in injury prevention at Oregon Health & Science University in Portland, says that's the nature of creating broad public health recommendations with incomplete evidence. "Good policy should be based on the best science," he said, but science always involves a certain amount of uncertainty. "We try to do the best we can for the greatest number of kids with the information we have," he explains, while ensuring "that policy recommendations will not be harmful." Ultimately, parents have to do the same thing: make the best decision they can with the information they have. "The AAP has to err on the side of being conservative," Mindell says, "but every family has to decide what works for them to be sure the baby is safe, that everyone is getting enough sleep and that everyone's wellbeing is taken care of."